MTD Micro Molding is built for high performance in only one area: the micro molding of advanced medical products. From handling materials to packaging, everything is done by people whose sole focus is medical micro injection molding. Medical Micro Molding is what we do. And all we do. MTD custom-crafts ultra-precision molded components that meet the exact requirements of the medical device industry. Other companies dabble in micro medical devices for the medical market, but we focus 100% on micro medical device design and production. 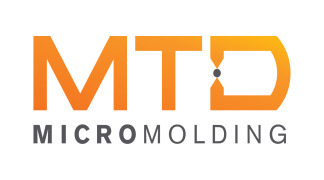 MTD is a ISO 13485 micro molding contract manufacturer certified with in-house tooling, unparalleled bioabsorbable molding expertise, and state of the art equipment – all under one roof. 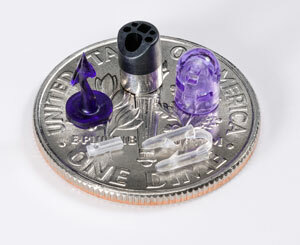 Our dedicated focus on bioabsorbable and drug delivery micro molding ensures successful delivery of complex custom products that nobody else can produce. 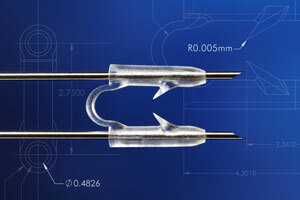 This fixation tack is used with a mesh in hernia repair surgery. As opposed to a bioabsorbable staple, soft tissue bioabsorbable anchors or screws compete with articulating and fixed fixation devices. The bioabsorbable fastener has two hollow legs connected by a flexible “bridge” and features sharp tips. Its flash allowance is 0.1mm max. This device has extreme precision required for the through-holes in this application, used for neurological implants.